Rupert Charles Wulsten Bunny (Australian painter, 1864-1947), The Annunciation (1893). Larger image. 38'I am the Lord's servant,' Mary answered. 'May it be to me as you have said.' Then the angel left her. "Virgin Mother!" If it seems like a contradiction in terms, an oxymoron, to us, what do you think it seemed like to Mary, that young teenager who had thrust upon her the most momentous birth in the history of the world? Virgin mother. A detailed examination of Mary's whole life throughout the Bible is beyond the scope of our study. We'll focus on two incidents that are central to the Christmas theme of the birth of Jesus -- the Annunciation and Mary's visit to her cousin Elizabeth. They give us some wonderful insights into Mary's heart and her faith and provide inspiration to our own spiritual lives, and they help us understand Jesus' divine nature better, as well. Before we begin, let me introduce Mary as St. Mary. The title may shock Protestant Christians, who rightly consider all believers as saints, but she has been known to the Church by this honorary title of "saint" for two millennia -- and for good reason. She has encouraged literally millions of Christians by her love for God, her submission to his will, and her willingness to see through to the end the path chosen for her by the Most High. So let's consider St. Mary together. Luke's account of the Annunciation (Luke 1:26-30), that is the angel's "announcement" to Mary of her mission of motherhood, tells us a number of things about Mary. It begins with the basic facts of her life. The angel "sent"1 from God is Gabriel, which means "God's valiant one. "2 He is no newcomer to the pages of Scripture. He had been sent in "swift flight" to the prophet Daniel (Daniel 9:21; 8:16). He was sent to speak to John the Baptist's father Zechariah while he was ministering in the temple of God (Luke 1:11-20) and told him, "I am Gabriel. I stand in the presence of God" (1:19). This awesome, mighty angelic messenger must have been fearsome to behold. The Angel's announcement takes place six months after Elizabeth becomes pregnant with John the Baptist. Mary lived in the village of Nazareth, in the hilly area southwest of the Sea of Galilee. We're also told that Mary was a virgin, betrothed but not yet married. This gives us some clues about her age, since we know that young women were usually betrothed at age twelve to twelve-and-a-half -- a full year before the actual marriage ceremony took place. Mary was probably a very young teenager when God spoke to her.3 Sometimes we discount the spiritual lives of young teens as immature, but God takes them very seriously. If you were a young teen and heard an angel speak these words to you, about you, you'd be scared spitless. Luke says that Mary was greatly troubled. The Greek word is diatarassō, which means to "confuse, perplex. 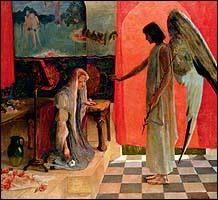 "8,9 Gabriel counters with the words "Do not be afraid, Mary," and Mary accepted the angel's "Fear not" at face value. 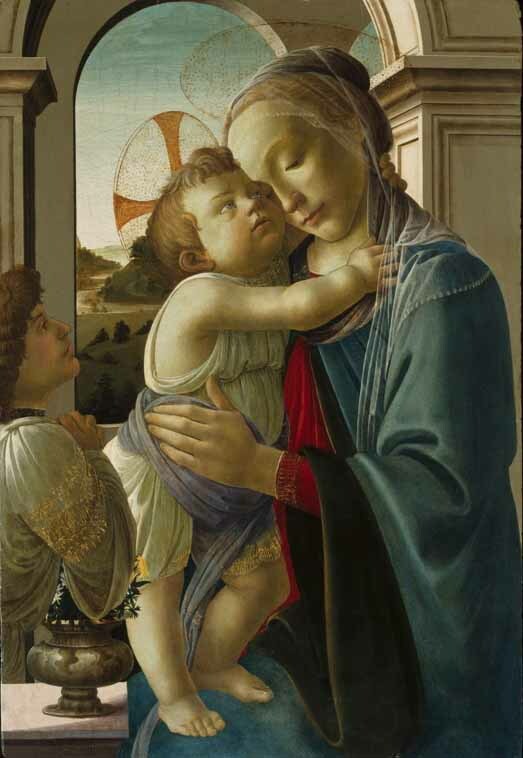 Sandro Botticelli, "Virgin and Child with Angel" (c. 1475), Chicago Institute of Art. Larger image. Notice the points of this announcement. 1. Mary will become pregnant. 2. Mary will give birth to a son. 3. The child must be given the name "Jesus," which we'll talk more about this when we study the angel's word to Joseph (Matthew 1:21). 5. His title will be "Son of the Most High." God first revealed himself to Abraham as the Most High God (�El �Elyon, Genesis 14:18-22). This title is used many times in Scripture (Psalm 7:17; 18:13; 50:14; 57:2; 83:18; Micah 6:6; Luke 1:17; 2:14; 6:35; 8:28; Acts 7:48; 16:17; Hebrews 7:1).11 "Son of" can mean literal biological or legal offspring, but as a Hebrew idiom it often carries the idea of "a person related or closely associated as if by ties of sonship, son. "12 A "son of perdition" (John 17:12; 2 Thessalonians 2:3) means the person who will go to perdition or destruction, "the man doomed to destruction" (NIV). "Sons of oil" (Zechariah 4:14) means "anointed ones," the term sons expressing their relationship to the anointing oil. The term "Son of God" in the New Testament refers to Jesus' close association with God himself, and is another way of referring to his divinity, "the only begotten of the Father" (John 1:14). To hear her son referred to as divine must have been overwhelming for Mary. 6. He will inherit "the throne of his father David, and he will reign over the house of Jacob forever," in other words, he will be the long anticipated King of the Jews, the Jewish Messiah, the "Son of David," who will reign over the Kingdom of God. your throne will be established forever." (2 Samuel 7:16). Jesus acknowledged before the high priest at his trial that he was indeed this heavenly Son of Man who will reign forever (Matthew 26:64) and it was on the basis of this statement that he was condemned for blasphemy. Q1. (Luke 1:31-34) What did the angel's announcement say about who Mary's Child was and who he was to become? Mary's words in Greek don't use the word for "virgin" (parthenos, 1:26), but translated literally are: "... seeing I know (ginoskō) not a man...." (KJV). What does she mean? How will God accomplish this, since the normal means of pregnancy isn't available? What the Angel announced was supernatural. A miracle. The response can be either: (1) Miracles just don't happen, so prove it to me, as Zechariah had responded to an angel's announcement in the temple (1:18), the response of unbelief. Or it could be: (2) Wow! That's amazing! How will it happen? the response of wonder and faith. Some people say we shouldn't question God, but Mary did. She asked "How?" Questions cause us to grow and learn. Questions stretch our minds and hearts and increase our understanding. Questions and the exploration for their answers contribute to our faith, even if the questions themselves may ultimately go unanswered. Mary's question arose from faith, not doubt. What would your response to the Angel be? Faith or unbelief? Q2. (Luke 1:34) In what way does Mary's "How?" question (1:34) to the angel's declaration differ from Zechariah's "How?" question (1:18)? Why was Mary rewarded and Zechariah disciplined? The angel explains delicately that the Holy Spirit "will come upon you" (eperchomai), not in a sexual way but in the same way as the Holy Spirit came upon the disciples in the upper room on the Day of Pentecost (see Acts 1:8) where this same word is used of the Holy Spirit. Two other analogies in the New Testament to describe a coming of the Holy Spirit upon a person are "filled" and "baptized." The Spirit transforms people! "The power of the Most High" is another way of saying "Holy Spirit," while "overshadow" (episkiazō) is another way of saying "come upon." The purpose of the Holy Spirit's coming is, "... So the holy one to be born will be called the Son of God" (1:35c). This sentence describes the mystery of the incarnation -- the divine becoming joined with the human. Mary is human, but her child, conceived by the Holy Spirit, is "holy" in the same sense that God himself is holy. What's more, this human-divine child will be called the Son of God. This is not just a figurative use of the Hebrew idiom "son of," meaning "closely associated with." It is quite clear that Luke intended for us to see this pregnancy and birth as a divine miracle, and the child as the biological (if that word has any meaning here) offspring of God and Mary. "I believe ... in Jesus Christ, his only Son, our Lord, who was conceived by the Holy Spirit, born of the Virgin Mary...."
"We believe ... in one Lord Jesus Christ, the only-begotten Son of God, begotten of the Father before all worlds, Light of Light, very God of very God, begotten, not made, being of one substance with the Father...."
The Nicene Fathers used an interesting Greek word, homoousios, "of the same nature" or "of the same essence," translated as "one substance" in our English translations. Homoousios, "same nature, same essence" was the terminology adopted by the Council of Nicea in 325 AD to describe Jesus' relation to the Father. The competing term, favored by the Arians, was homoiousios, "similar essence," which was rejected by the Council. The Nicene Creed affirms that Jesus is fully divine. He is not just "similar to" God. He is God in the flesh, God incarnate! Q3. (Luke 1:35) What does the virgin conception teach us about Jesus' nature? How central is the doctrine of the virgin conception to the Christian message? Like Abraham's wife Sarah, Elizabeth, Mary's elderly relative was well beyond menopause. All her life she had been called barren, childless. That is until God wanted to do a miracle. And so Elizabeth's child John the Baptist was a "miracle baby," born to two senior citizens. 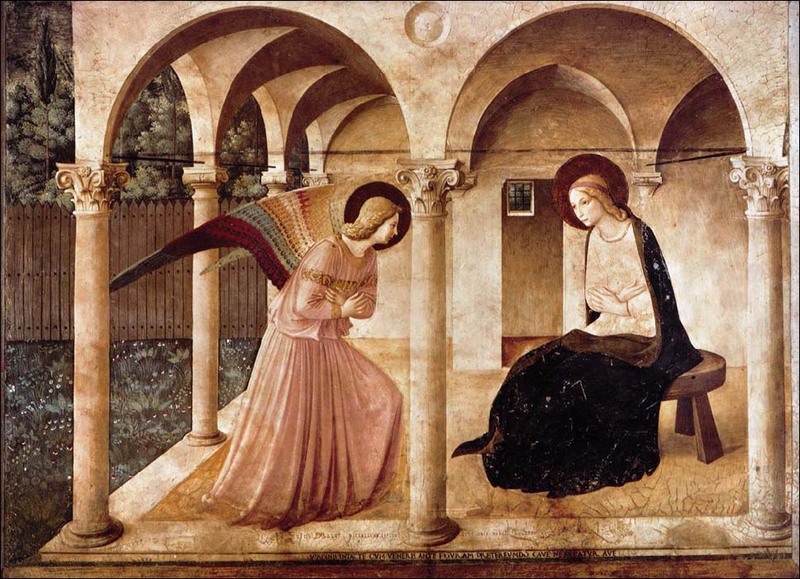 The angel tells Mary: "Elizabeth, your cousin, is already six months pregnant, by the way." And then he concludes, "For nothing is impossible with God!" Nothing. 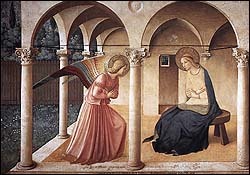 Every time I read Mary's response to the Angel's announcement and explanation, I am awed: "I am the Lord's servant. May it be to me as you have said." Here is a teenager facing misunderstanding and rejection from her family, her betrothed, and her townspeople. For a betrothed woman to bear a child out of wedlock to someone not her husband could potentially even result in stoning (Deuteronomy 22:22-24). And yet she agrees. Mary affirms the bedrock truth that undergirds our discipleship: "I am the Lord's servant," or as the KJV puts it, "Behold, the handmaid of the Lord." After all is said and done, after we have explored all the possibilities, we still must decide: am I a servant or a master? Is my allegiance to the Lord or to my own desires? Sometimes it takes great turmoil in our souls to come to the place of submission, but come to it we must. Even before Jesus was conceived, Mary was faced with the decision: Will I obey and make way for this King? or Will I take the easy way that avoids difficulty and pain? To her everlasting credit, Mary's response of faith is what our response must be: "I am the Lord's servant. May it be to me as you have said." Q4. (Luke 1:38) What is the essence of Mary's positive response to the angel? What can we learn from her response for our own lives? In what sense was Mary's response an "informed consent"? When we respond to God, what do we consent to? "42In a loud voice she exclaimed: 'Blessed are you among women, and blessed is the child you will bear! 43But why am I so favored, that the mother of my Lord should come to me? 44As soon as the sound of your greeting reached my ears, the baby in my womb leaped for joy. 45Blessed is she who has believed that what the Lord has said to her will be accomplished!'" I am including this prophecy because it give us greater insight into both Mary and her child. From the Angel's and Elizabeth's words come the "Hail Mary" prayer, Ave Maria in Latin. While the prayer itself dates from the Middle Ages, several elements derive directly from our passage. The Lord is with thee..."
"Blessed art thou among women, and blessed is the fruit of thy womb, Jesus." Holy Mary, Mother of God...."
I'm not suggesting praying to St. Mary herself or asking her to mediate or intercede for us with her Son as our mediatrix (1 Timothy 2:5). Jesus instructs his disciples of their privilege to pray directly to the Father in his name (John 16:26-27). Nevertheless, I'm interested in how this prayer expresses much of what we know about Mary from Luke 1. Q5. 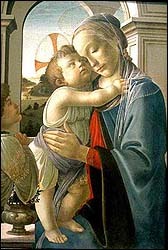 (Luke 1:42-43) In what sense are the titles "Blessed Virgin Mary" and "Mother of God" appropriate for Mary? Why are we sometimes hesitant to exalt her as "blessed among women"? Mary spends about three months with Elizabeth and was probably with her beloved, elderly kinswoman at the birth of John the Baptist. She is now perhaps four months pregnant herself and the life within her beginning to show. Now she must face her parents and her fiancé Joseph with the truth of this miracle that she cannot explain. But more of that when we study "Joseph, the Stand-In Father" in the next chapter. In Mary we see an amazing young teenager who is entrusted by God to bear his Son and mother him through his growing-up years. Though she can't know all the future nor really understand, she responds, "I am the Lord's servant." No wonder the Church holds her in highest esteem to this day. May you and I be ready to respond with that same submitted willingness when God calls us to serve him. Lord, we are amazed at Mary's poise and composure through all this. We are awed by her humble submission. With the whole Church of Jesus, we honor Mary, the Blessed Virgin. Father, help me to count it an honor to be your servant, to be asked to serve you in a particular way. Help me to serve with joy and not with a grudging or complaining attitude. Help me to be a servant of whom you can be proud like your child Mary. In Jesus' name I pray. Amen. Apostellō, "to dispatch someone for the achievement of some objective, send out, send away" (BDAG, 120-121, 1.b.δ.). Gabriēl, BDAG 186. It is a Hebrew compound word from geber, "mighty man" + �ēl, "God." 'Geber is from the verb gābar, "prevail, be mighty, have strength, be great" (John N. Oswalt, gābar, TWOT #310). Joachim Jeremias, Jerusalem in the Time of Jesus (Fortress Press, 1969, translated from the third German edition, 1962), p. 365, cites Strack and Billerbeck (II, 374), that the usual age for a girl's betrothal was between twelve and twelve and a half. He cites M.Ket. v.2 that the marriage itself ordinarily took place one year after betrothal. Geoffrey W. Bromiley, "Mary," ISBE 3:269-273. The issue hinges on whether "of the house of David" in Luke 1:27 goes with "virgin" or "Joseph." See also Luke 1:32 and Acts 2:30, which seem to indicate a physical descent from David. Charitoō, "to cause to be the recipient of a benefit, bestow favor on, favor highly, bless" (BDAG 1081), from charis, "favor, grace." The KJV adds at the end of 1:28 "blessed art thou among women," following ancient 'Greek manuscripts such as A C D Θ and the Textus Receptus. However, the words are omitted by a wide diversity of early texts, including Aleph B L W Ψ and others. Metzger says, "It is probably that copyists inserted [these words] here from verse 42, where 'they are firmly attested. If the clause had been original in the present verse, there is no adequate reason why it should have been omitted from a wide diversity of early witnesses" (Bruce M. Metzger, A Textual Commentary on the Greek New Testament (United Bible Societies, 1971), p. 129). Phobeō, "to be in an apprehensive state, be afraid, become frightened," from which we get our English word "phobia" (BDAG 1060-1062). See my book Names and Titles of God (JesusWalk Bible Study Series, 2006), chapter 1. Huios, BDAG 1024-1027. Peter Wülfing von Martitz, Georg Fourer, Eduard Schweizer, Eduard Lohse, and Wilhelm Schneemelcher, huios, TDNT 8:334-392. Merriam-Webster's 11th Collegiate Dictionary (Merriam-Webster, 2003), p. 792. The use of the theotokos, "God-bearer" to describe Mary was part of the Nestorian controversy to define the union of human and divine natures in one person, Christ. Just after the first Nicene Council, this controversy took place between Nestorius, Patriarch of Constantinople (who emphasized the distinction between Christ's human and divine natures) and his rival Cyril of Alexandria (who emphasized the union of Christ's natures). The discussion gets pretty obscure and theological, but it clarified the issues for the church. For more on this see J.N.D. Kelly, Early Christian Doctrines (Second Edition; Harper & Row, 1960), pp. 310-343.